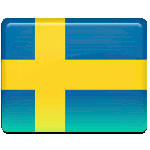 June 6 is National Day of Sweden. This holiday is regarded as one of the most important ones in the country. National Day of Sweden was introduced in 1916 at the Stockholm Olympic Stadium to honor the election of King Gustav Vasa in 1523. This day is considered as the foundation of Sweden. This event also marked the end of Kalmar Union, when Sweden was ruled by Denmark, thus the country gained its independence. However, these events happened so many years ago, that they don't have much importance for the modern holiday. Until 1983 the day was celebrated as Swedish Flag Day, and later its name was changed. In 2005 National Day of Sweden replaced Whit Monday and became public holiday. This led to some changes, that are not always accepted by the Swedish unions. June 6 can periodically fall on the weekend, while Whit Monday is always Monday. This led to lesser days off in some years. The way out was found by giving everyone an extra day off, that can be used any time during the year.